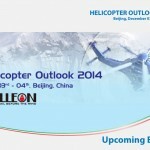 Under the following background, Helicopter Outlook 2014 will take place on 3rd – 4th, December, 2014. According to report, the high-profile Regulations on The Use of Low Altitude Airspace Management (for Trial Implementation) has been formed. Once the low altitude airspace management regulations to implement, communication & navigation system and low altitude flight service stations will be large-scale construction, and access to national level investment. Recently, China’s first low altitude route “Zhuhai – Yangjiang – Luoding” route has officially shipping on June 26th, mark of China’s low altitude airspace reform entered the practical stage. According to data, China existing 178 general aviation enterprises, registered 1610 general aviation aircraft, with 399 general airports and temporary landing point. It is predicted that, over the next 20 years, the number of civilian helicopters in China is expected to reach about 10000, over the next 10 years, China general aviation industry market demand over 640 billion CNY.